Kinneret (Hebrew: כִּנֶּרֶת, also known as Moshavat Kinneret to distinguish it from the neighbouring settlement of Kvutzat Kinneret (which is organised as a kibbutz) is a moshava on the southwestern shore of the Sea of Galilee in Israel. Located in the north of the Jordan Valley, 6 kilometers south of Tiberias, it falls under the jurisdiction of Emek HaYarden Regional Council. The village sits at around 185 meters below sea level, and in 2017 it had a population of 680. Kinneret Farm, an experimental training farm, was founded in 1908, at the same time as the moshava and adjacent to it, as a separate and autonomous project. 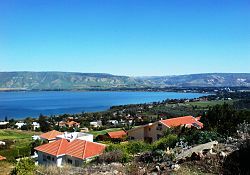 The name of Moshavat Kinneret derives from an ancient Canaanite town, which was however located close to the other, northern end of the lake's western shore. According to the Hebrew Bible, the town of Kinneret fell into the allotment of the tribe of Naphtali (Joshua 19:35), while the area of modern Moshavat Kinneret was probably also part of Naphtali, or (depending on interpretation) of Issachar or Zebulun. In the Hebrew Bible the Sea of Galilee was named Yam Kinneret, lit. the Sea of Kinneret, another reason for the name chosen for the moshava. The nearby ancient town of Bet Yerah was not inhabited during the time of the kingdoms of Israel and is thus not mentioned in the Hebrew Bible, its main relevance to the moshava being that it gave its name to the local high school, which is attended by children from the entire area, not just Moshavat Kinneret. The Roman-era site known as Tarichaea is said to have been in the vicinity. Two entities were established at this location: the village or "moshava", and a training farm known as Kinneret Farm or Kinneret Courtyard. The village was part of the settlement project of Baron Edmond de Rothschild and the Jewish Colonization Association, while the Kinneret Farm was the initiative of the Palestine Bureau of the Zionist Organisation. The village and the farm shared infrastructure (health, security, cultural life), but served different purposes. The village was established as a frame for families willing to settle the land and start their own business. After Israeli independence the village became a local council with an area of 7,000 dunams. However, as part of a local government reorganisation in 2003, it came under the control of Emek HaYarden Regional Council. The farm is known in Hebrew as Havat Kinneret (Hebrew: חוות כנרת‎, lit. Kinneret Farm) or Hatzer Kinneret, the Kinneret Courtyard. In June 1908 the Farm began as an experiment at Kinneret village, built on the site of a ruin called Mallāha. Arthur Ruppin, the head of the Palestine Office of the Zionist Organisation and one of the leading Zionists of the time, was the initiator and man in charge. Unlike the moshava, the farm was meant as a training facility for agricultural work and became a laboratory for social and economic experiments, many of the structures and organisations on which pre-State Jewish and post-1948 Israeli society relied and still relies being initiated here. Such are the communal settlement forms of the kvutza, kibbutz and moshav, the women's rights movement—beginning with an agricultural training farm for women in 1911 and continuing with the first assembly of women farmers in 1914—, the cooperatives HaMashbir (for the sale of affordable food during World War I; est. 1916) and Tnuva (milk and dairy products; est. 1926), the Solel Boneh construction company (est. 1921) which emerged from the Work Battalion, the Bank Hapoalim or "workers' bank", the kupat holim public health care system, and last not least the Haganah paramilitary organisation. The Farm residents also had a major role in establishing and shaping the Histadrut labor union. In its early years it was joined by local Jewish farmers from the surrounding villages, and very soon after by the very young pioneers of the Second Aliyah. The original Jewish settlers stayed in the so-called Khan, a word meaning caravansary and being no more than a storage building bought from a local Bedouin tribe. The early days were marked by starvation and conflict. After a workers' strike in October 1909, a co-operative split away from Kinneret: seven pioneers founded the first kvutza, eventually named Degania. They derived inspiration from Ber Borochov's ideas. In 1912, the original founders of the moshava were joined by ten Yemenite Jewish families who worked in draining swamps, as also in growing vegetables, but because of cultural differences between the new immigrants and the original founders they were compelled to leave the moshava, after they had been there eighteen years. In 1930, they took leave of the place and resettled in Kefar Marmorek, a suburb of Rehovot. Beit Ha'almot or Havat Ha'almot (lit. the Maidens' House or Maidens' Farm), an agricultural training farm for women, was established within the colony in 1911; it had to be closed in 1917 due to the hardships of World War I. Pioneers from the Kinneret Farm founded the first kvutzot or small farming communes, Degania Alef in 1910 and Kvutzat Kinneret in 1913, as well as the first large farming commune or kibbutz, Ein Harod, and the first communal agricultural village or moshav, Nahalal, both in 1921. One of the founders of the Kinneret Farm, Ben-Zion Israeli (1887–1984), helped reintroduce date palms to Palestine by travelling to Iraq, Iran, Kurdistan and Egypt in the 1930s where he identified suitable varieties of which he bought and adventurously brought back large quantities of saplings. Many of the initiatives had to do with the activity of Berl Katznelson. Moshav Kinneret operates a history museum in a building that housed the first local hospital. The restored Kinneret Farm also functions as a museum and seminary center. To the east of the village, across the road from the restored Kinneret Farm, is the historic Kinneret Cemetery where many pioneers and leaders of the Labour movement are buried, among them Berl Katznelson, Nachman Syrkin, Rachel Bluwstein, Ber Borochov, Moses Hess, Avraham Herzfeld and Shmuel Stoller. The first grave was dug in 1911 for Menahem Shmueli (Mamashi). ^ "Tel Bet Yerah Research and Excavation Project". ^ "Kinneret Courtyard". Archived from the original on 2014-08-19. ^ a b c d e f g h "Hamashbi Hamerkazi". ^ Documentary: The Unpromised Land, Ayelet Heller (director), released in 1992. It relays the story of Yemenite settlers in Kibbutz Kinneret in 1912 and their removal. ^ Shoshana Madmoni-Gerber, Israeli Media and the Framing of Internal Conflict: The Yemenite Babies Affair, New York 2009, p. 33 ISBN 978-0-230-61346-1.